The Rebel Sweetheart. : Foodie Goodie | Cozy at Cafe Arabela. Here in the South (or in the Philippines, for that matter) whenever we say 'tsinelas' (slippers), we think of Liliw. About 45 minutes away from the city where I live, Liliw is a small, highland town best known for its native delicacies and world-class shoe industry. These days, whenever 'Liliw' is mentioned, 'Arabela' also comes to mind. 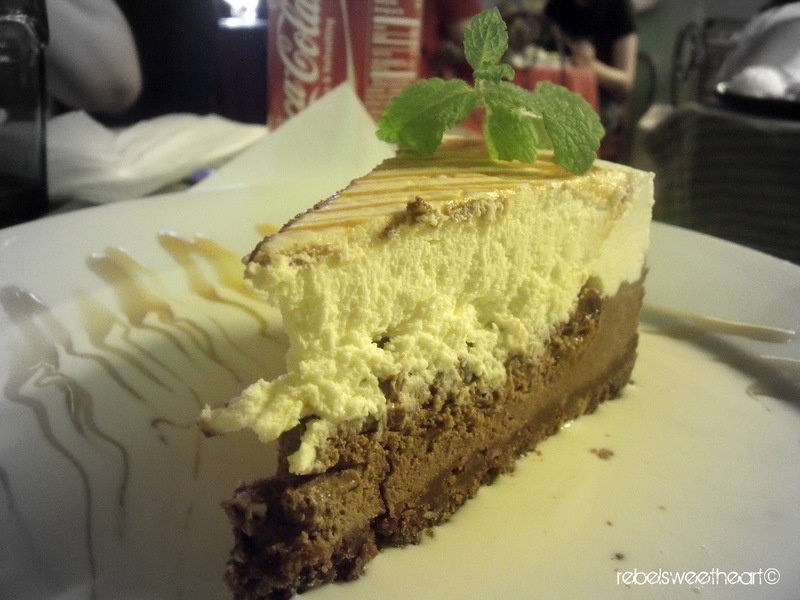 It's a cozy little corner cafe, with a menu that boasts of pizza, pasta, steaks, and the most sinful desserts ever. Arabela gets a little too cozy at times (read: cramped) most of the time, because of the steady flow of diners. Patrons from all ages (kids, teens, adults, babies even! ), and groups of all sorts (families, friends, officemates, lovebirds) all hie off to enjoy the great food that Arabela has to offer. 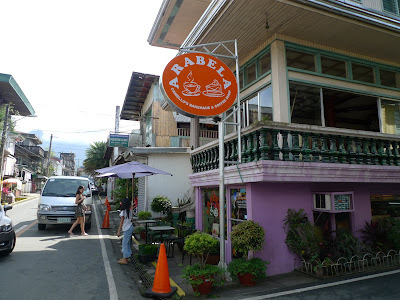 We went to Liliw last Saturday, and because it's the weekend, Arabela was at its busiest. It took about 10- minutes for us to be seated, and around 10 more minutes before our orders were served. Fixated at this lamp while waiting for my pasta. But when you're having food as great as theirs, it was worth the wait. Yue wanted chicken so I got him this Chicken Roll. As described on the menu: Rolled chicken breast fillet with ham, carrots, and pickles served with mixed vegetables and rice. No complaints about this dish. Everything was perfect from the chicken, to the dipping, even to how the rice was cooked. And the buttered vegetables were too tasty to be true! They must have been cooked in loads and loads of butter. And no, I'm not complaining. The T-Bone Steak is the restaurant's best seller, which is what my siblings had. I wasn't able to taste it for myself, but my brother - who wolfed it down leisurely - vouches for the taste. Dulce de Leche cheesecake, Php 85. Desserts are a must-try at Arabela's. Never leave Liliw without having a bite of these sumptuous and sinful treats. This Dulce de Leche cheesecake was the first thing I noticed when we entered the restaurant, and from there, I was dead-set on ending my meal with this. On the other side of the table, Maggie was frustrated because no one wanted to give her a sip of this ripe mango shake. LOL. Ripe Mango Shake, Php 95. If you're going to Liliw make sure to stop by at this cozy little cafe. It's a dining experience you surely wouldn't want to miss. 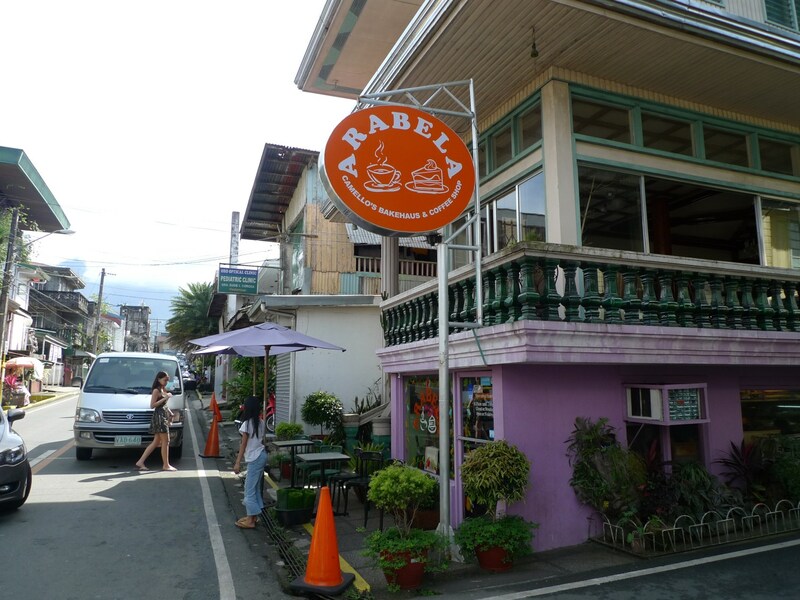 Cafe Arabela is located at 503 Rizal Street, Liliw, Laguna. Sharing with Food Friday, Food Trip Friday, Yummy Sunday, i Heart Macro, Oh Snap!, Sunday Snapshot. Okay you're making me want to take an international trip. What a delightful cafe! No wonder they're so busy! The best Dulce de Leche Cheesecake I ever had was actually in Manila so I can bet this is amazing stuff! Would love to try that pasta and the chicken of course. :-) Looks really yummy! Tat T-Bone looks delicious! Awesome food, definitely worth the wait! Ive never been there but I think I have heard of it before. If ever we could have the chance to go to Laguna, I might suggest to visit that place. Ang nakakuha ng attention ko is the shake and also the dessert! Yum yum! Okay, now I want to go! The pasta looks fantastic! I think I haven't been to Liliw, Laguna yet but their native tsinelas and espadrille shoes are really what I know about this place. I also love pasta. But right now, I'm craving for Dulce de Leche cheesecake. I didn't know that there's a hidden gem in Liliw, Laguna. This will be included on my list of restaurants to visit if I go there. Wow, P260 for a T-Bone Steak? That's really cheap! your post made me hungry! Pancetta Magretta and the T-Bone Steak looks so yummy! awww, lalo akong nagutom. i've never heard about the place, but their food looks really yummy. i must keep this cafe in mind. Btw, Maggie looks super adorable on her first photo! <3 She looked frustrated indeed on her 2nd photo though.. XD And I can really sympathize with her 'cause I want to have a sip of that ripe mango shake!